The story of Relativ starts at a supermarket in Utrecht, Holland. It was here the former Buurman & Buurman duo, Luiz and Tim, met while both working there. Their mutual love for electronic music is what brought them together and what has kept them together ever since. At that time, around 5 years ago, Luiz was already dj-ing; something Tim had always wanted to do as well. So Luiz taught him how to. And while mastering these skills, the two hit it off like a house on fire and decided to form a dj-duo (Buurman & Buurman). From then on, not only would they regularly play at clubs like Basis (Utrecht) and Chicago Social Club (Amsterdam), but Luiz and Tim were already producing their own tracks too. 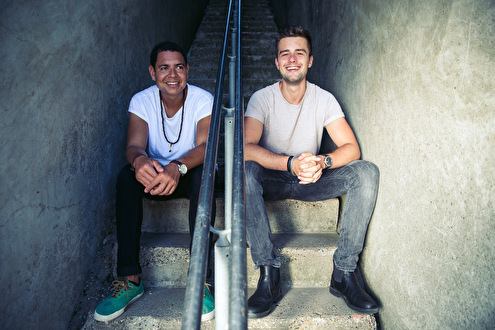 Their first release '1970', which came out in May 2014 on Armada Music, was an instant Soundcloud hit. The track opened up doors for the duo, getting them residencies with Verknipt and Nachtcollege, two well-known organizations in Holland. In the summer of 2016 the two played at festivals like Lakedance, Wish Outdoor, Dance Valley and Verknipt Festival every weekend. But their biggest achievement, until now, has to be their Straf_Werk Festival 2017 booking. In previous years Luiz and Tim would attend the festival together, wishing to once take the stage themselves and now that moment has arrived. In these 5 years of playing together the two have evolved and learned a lot about the business they work in. Slowly everything became more serious. Hence the new artist name 'Relativ' which was adopted earlier in 2017. Even though the moniker Buurman & Buurman paved the way for Luiz and Tim and had a very positive effect on their career, it was time for the next step.The sound of Relativ has developed into a more timeless sound, dj-wise as well as production-wise. As for productions, the late summer of 2017 sees another release by the duo, this time on Max Chapman's label Resonance where a track will be released on a compilation of the label. Playing together means to be connected and balance each other out. Something Luiz and Tim comprehend very well. They both have their own specialties, making up for the perfect harmony in their sets, but also when not on stage. It also means not having to travel by yourself and to have shitloads of fun as well. The modest, social and pleasant vibe of the two combined with their love for making music and dj-ing has got Relativ to the point where they are now. With another great summer in prospect, Relativ continues to push the envelope with every gig they play. AIROD, Benny Rodrigues, Cuartero, Franky Rizardo, Ghost in the Machine, Jorn Luka, Luuk van Dijk, Manni Dee, Noneoftheabove, Prunk, Relativ, ROD, Wouter S.